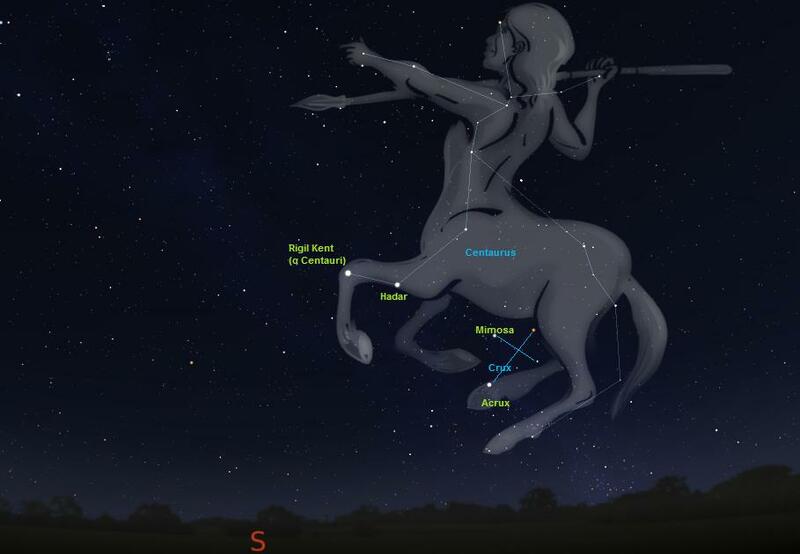 Centaurus is the name of a constellation. (Often, its genitive, 'Centauri' is used, too). It is the home of our closest neighbour: Alpha Centauri is the nearest star system, and therefore is often refered to as Alpha Proxima. It is only approx. 4,3 light years away, and actually consists of three stars: Alpha Centauri A, B and C.
A and B are a close binary system, and are gravitationally bound to C. (So A/B are a distant binary with C). At this moment, Alpha Centauri C is the Sun's nearest neighbor, which is why it is often called Proxima Centauri (See Proxima Centauri). Alpha Centauri A is the brightest of the three. It is also known as Rigil Kent, Rigil Centauri or as Toliman. Several planets circle A/B, and three of them are inhabited. One of them would be a desert planet, and there has been some speculation that this might be the 'real' Serpo. It is unclear whether C has planets, too, but at least one contactee (Horst Fenner) claims having met extraterrestrial visitors from a planet in orbit around C. (See Proxima Centauri). The planet Metharia circles A/B, and is inhabited (colonized) by a humanoid species, from Vegan descent. The inhabitants are usually called the Santinians or sometimes the Centaurians. They are believed to be member of the Federation of Planets and/or the Ashtar Command. (For more information on the inhabitants, see: Santinians). A third species, already mentioned above, would live on a planet that orbits Centauri C. (See Proxima Centauri). A fourth species would inhabit a planet called Apu, which contactee Sixto Paz Wells claims to orbit Alpha Centuari. (See: Apu). Additionally, there are - at present unconfirmed - rumours about Greys that would be coming from the Centaurus system. African myths mention a race of shapeshifting reptilians that came down from Alpha Centauri, intervened in our DNA and subjugated mankind. These beings are known by many names, including Chitauri (note the similarity with "Centaur'") and Imanujela (note the similarity with the Hebrew "Emmanuel" / "Immanuel"). The Branton material, along with Sheldon Nidle, mentions a group of "renegade centaurians" that broke away from the Federation of Planets. One source mentions a total of 19 different races in the system, including a reptilian race. There also are rumours that an operational stargate connection to Alpha Centauri would exist. This topic was copied from the HyperBase, but has been partly revised and expanded upon.